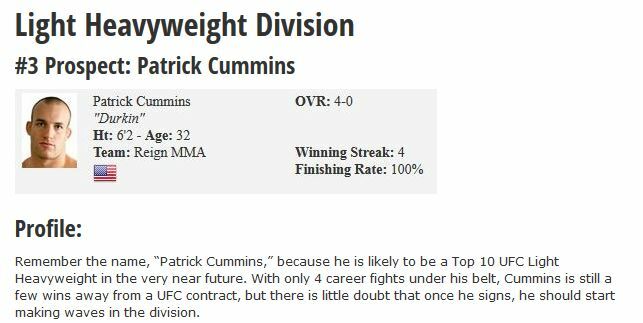 Remember the name, “Patrick Cummins,” because he is likely to be a Top 10 UFC Light Heavyweight in the very near future. With only 4 career fights under his belt, Cummins is still a few wins away from a UFC contract, but there is little doubt that once he signs, he should start making waves in the division. Cummins grew up in Pennsylvania, playing a variety of sports alongside his two brothers. All 3 siblings eventually attended Penn State University where Cummins made the wrestling team as a walk-on. He quickly worked his way up from the bottom, achieving All-American status as a heavyweight twice in his career. In 2003, he finished top 4 in the nation and just one year later earned runner-up honors After college, Cummins attempted to make the Olympic wrestling team, but ultimately fell short of that dream. During his Olympic bid, he roomed alongside Muhammed Lawal, who eventually planted the seed for Cummins’ transition to mixed martial arts. Cummins began training and shed nearly 50 pounds to get down to Light Heavyweight. In 2010, Cummins participated on the EA Sports MMA Fighter Exchange, which paired an aspiring MMA prospect with a Strikeforce top contender. Cummins landed the always entertaining Jason “Mayhem” Miller. Alongside Miller and his manager Ryan Parsons, the trio ventured down to Brazil where they trained at the famed Nova Uniao complex. Cummins reaped the benefits as a few months later he submitted his way to a 1st round victory. With his successful MMA debut behind him, Cummins looked destined for the fast track to success, but unfortunately some troubles from his college days came back to haunt him. Cummins and fellow prospect Eric Bradley were sentenced to jail time due to stealing items from fraternity houses. After 8 months, Cummins was released, and returned back to California where he began training at Reign MMA. Cummins returned to the cage at Pro Elite 3, winning once again via 1st round finish, but Pro Elite soon went under and Cummins was left scrambling for potential opponents. He sat out for over a year before finally returning in 2013 to pick up consecutive wins over journeyman opponents. Unfortunately, Cummins has continued to find it difficult to find fights as over 40 opponents have turned down fights with him. Cummins trains at Reign MMA, which is one of the top camps in the world right now. He trains daily with the likes of Mark Munoz, Jake Ellenberger, and their newest addition Chael Sonnen. One would think that Cummins would have the UFC connections due to his camp affiliation, but it just happened yet, though not for a lack of trying. The UFC brass know very well who Cummins is and they have advised him to pick up a few fights before potentially bringing him in. Cummins’ manager, Ryan Parsons, has done a commendable job getting his name out there. He recently appeared on Ariel Helwani’s MMA Hour, which can be seen here. Cummins has also been featured by most of the big MMA websites in some recent articles. Dennis Bermudez is the only client of Parsons’ currently on the UFC roster, but with promising prospects Satoshi Ishii and Gregor Gillespie, it would be no surprise to see all 4 of these fighters competing in the UFC in the next few years. So, with only 4 career fights and already being 32 years old, why is Patrick Cummins considered to be an elite level prospect? Pure and simple, Cummins’ wrestling, training environment, and previous experience wrestling bigger bodied fighters gives him a unique edge that should immediately pay dividends at the UFC level. He is not polished by any means when it comes to his striking, but he has an excellent killer instinct and is ultra-tough in the trenches. Cummins is used to wrestling against guys the size of Cole Konrad, Steve Mocco, and Cain Velasquez. He understands the intricacies of positioning and leverage. He is also explosive and knows what it takes to drive through his takedowns. Cummins’ wrestling should immediately allow him to contend with anyone on the UFC’s current roster. Yes, that even means Jon Jones. I am not saying Cummins would win, but you just can’t disregard his skills as you would most other Light Heavyweights. Cummins is an aggressive style of wrestler. He’s in your face and doesn’t try to hide his strategy. He’s there to win, and his way to win is to take you down and either pound you out or submit you. Cummins’ striking is still a bit of a mystery due to only 2 of his fights being available on YouTube. He’s only been in the sport for about 3 years, so you can’t fault the learning curve that he’s probably dealing with. Luckily, he hasn’t strayed away from his wrestling pretending to be something he’s not. 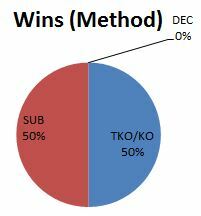 Cummins brings a similar strategy to that of Chael Sonnen, which is to push the pace, always move forward, and basically negate the distance that usually makes good strikers effective. Some may point to Ryan Bader as a comparison for Cummins, but Bader has at times fallen in love with his striking, which has ultimately cost him big fights. If Cummins brings a Sonnen-like mindset and gameplan into his fights, he can literally go in and beat Top 15 competition right now. Cummins is getting a late start in the MMA game, and he could, and likely will run into some bumps along the road once he enters the UFC. Cummins is likely not ready to face elite level strikers like Machida or Teixeira, but I don’t think anyone is for that matter. A quick glimpse across the UFC Light Heavyweight division reveals that many of their Top 10 stars are aging and are likely close towards retirement than their prime. The window of opportunity is there for Cummins to come in and make his presence known. There are too many unknowns to truly predict Cummins’ rise up the UFC ranks. He’s never been past the 1st round and I’ve never really seen him be hit. What happens when he gets put on his back or when he can’t get his opponent to the ground. Some of these questions will be addressed in the coming months, but based off the limited footage I have seen, expect big things from Patrick “Durkin” Cummins.